In England the first bus service which was launched in 1662 was more like horse carriages and was invented by French mathematician Blaise Pascal. Decades after this invention took place, prototypical British gentleman scientist and inventor Sir Goldsworthy Gurney designed the steam-powered bus in 1830. Blaise Pascal named his public bus service in Paris ‘carriages’ but those buses ceased to operate after 15 years and they did not appear again until horse-powered multi-person carriages emerged in Paris again in about 1819 or 1820. "Omnibus" is a Latin word meaning "for all." They were more like modern-day buses custom made for passengers’ comfort, to transport multiple people along a route and allow them to board or debark at locations along the route without the necessity of having stations. The first regular bus route appears to have started from Manchester to Liverpool, beginning in 1824. Ten years later steam-powered buses came into service in England. The Siemens brothers in 1882 invented the electric trolleycar which did not go into service carrying passengers until 1901 in Germany, and 1911 in England. In 1827, George Shillibeer introduced the first school bus for Quaker school at Abney Park in Stoke Newington in the North-East of the United Kingdom. It was horse-drawn and designed to carry twenty-five children. Buses have been used on the streets of London since 1829, when George Shillibeer started operating his horse drawn omnibus service from Paddington to the city. 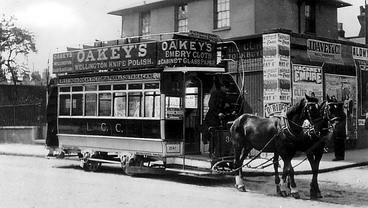 In 1850 Thomas Tilling started horse bus services, and in 1855 the London General Omnibus Company (LGOC) was founded to amalgamate and regulate the horse-drawn omnibus services then operating in London. LGOC began using motor omnibuses in 1902, and manufactured them itself from 1909. In 1904 Thomas Tilling started its first motor bus service. The last LGOC horse-drawn bus ran on 25 October 1911, although independent operators used them until 1914. The first double-decker bus was invented in Paris in 1853; it was a horse-drawn omnibus. The upper floor was cheaper and often uncovered. The first double-decker motor bus in Paris, Schneider Brillié P2, appeared in 1906. It was designed to allow more passengers and to replace the horse-drawn double-decker omnibus. In 1912 the Underground Group, which at that time owned most of the London Underground, bought the LGOC. In 1933 the LGOC, along with the rest of the Underground Group, became part of the new London Passenger Transport Board. 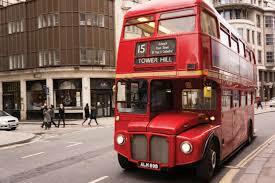 The name London General was replaced by London Transport, which became synonymous with the red London bus. Bus numbers were first used in 1906. When the independent firms started in 1922, they used General route numbers, along with suffixes from the alphabet to denote branch routes. In 1924, under the London Traffic Act, the Metropolitan Police was given the authority of allocating route numbers, which all buses had to carry. This ultimately led to chaos and in the London Passenger Transport Act of 1933 the powers of allocating route numbers was taken away from the police and handed once again to professional busmen. Suffixes were gradually abolished over the decades, the last such route in London being the 77A, which became the 87 in June 2006. The LPTB, under Lord Ashfield donned responsibility for all bus services in the London Passenger Transport Area, an area with a radius of about 30 miles of central London. This included the London General country buses (later to be London Transport's green buses), Green Line Coaches and the services of several Tilling Group and independent companies. London buses continued to operate under the London Transport name from 1933 to 2000, although the political management of transport services changed several times. The LPTB oversaw transport from 1933 to 1947 until it was re-organised into the London Transport Executive (1948 to 1962). Responsibility for London Transport was subsequently taken over to the London Transport Board (1963 to 1969), the Greater London Council (1970 to 1984) and London Regional Transport (1984 to 2000). However, in 1969 legislation was passed to transfer the green country services, outside the area of the Greater London Council, to the recently formed National Bus Company. Trading under the name London Country the green buses and Green Line Coaches became the responsibility of a new NBC subsidiary, London Country Bus Services on 1 January 1970. A former network of express buses operated by London Transport in central London was the Red Arrows. The routes, all numbered in the 500s, ran from main line stations to various locations in the West End and City. They were introduced in 1966 and expanded in 1968, but in the 1990s they were gradually phased out and only two former routes, 507 and 508, continued. In 1979 the operation of London's buses under the GLC was divided among eight areas or districts.